First I moved the tablet from the Valley Panel to a corner by the entrance. There are two reasons for that change. It’s obviously more visible to the public. And a PIR sensor is connected via an Arduino to the tablet. Eventually that sensor will trigger automated automation when the public is present. The tablet now also displays some prominent message. The example above is shown when the layout, the DCC, or the computer are turned off. There is no automation running and now the tablet quite explicitly says so. I hope that will help the public and the museum staff. When the layout is powered, the message indicates whether the trains are waiting for the green activation button to be pushed, or whether a train is currently running. And for Saturday when operators are running their own trains, the tablet displays a clear “Automation Stopped” message. Finally, I made a non-visible change to the main Conductor script. It now has a built-in timer to send an emergency stop command to all trains if they don’t reach their destination within a specified time. This should “alleviate” some derailment problems we had in the past, and I had been eager to do it for a while -- lack of time and priorities had delayed that effort. Not anymore. However now it’s even better since I also integrated it with the tablet’s messaging display. 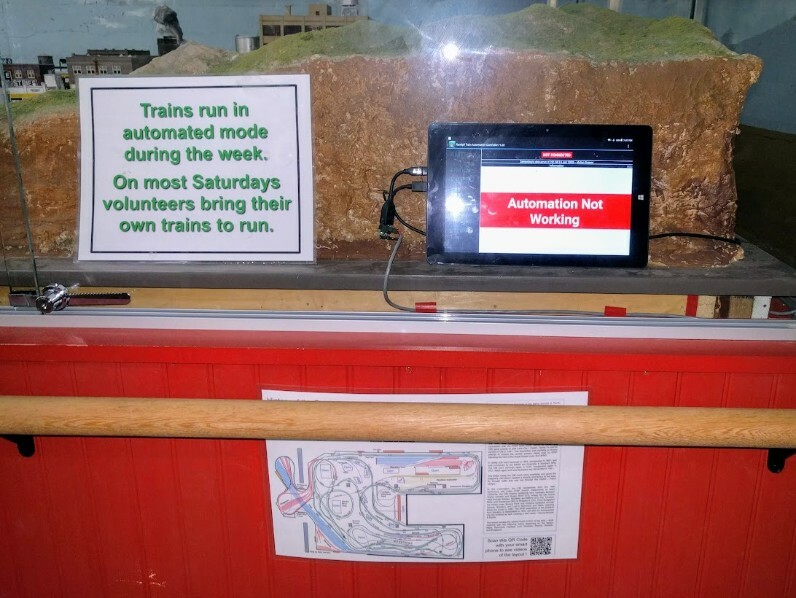 Not only failure to reach destination will stop the trains, but it will also display a prominent “Automation Error” message on the tablet for all to see. The second tablet, located inside next to the main Valley Panel, displays the same information. This should be useful for Saturday operators. Except I’ve noticed twice the tablet’s display not working properly (e.g. displaying some random static / garbled pixels, and that gets fixed by rebooting it). So I may have one more thing to fix on my hands. There’s always something to fix in this place. And not enough time.